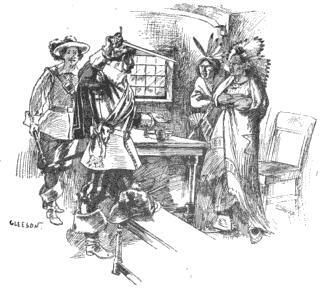 In 1614, Squanto and 23 other Indians were kidnapped by a lieutenant under Smith. This lieutenant sold some in Malaga, Spain. Spanish friars rescued the others, including Squanto. He found his way to England. He was employed by John Slaney of the Newfoundland Company, and was sent to Newfoundland in 1610, probably as an interpreter. He returned to his homeland in North America in 1619. His people had been wiped out by disease. He lived with the Wampanoag people. 1605 map drawn by Samuel de Champlain of Plymouth Harbor (which he called Port St. Louis). "F" designates wigwams and cultivated fields. For the rest of the legend, see Pilgrim Hall Museum. 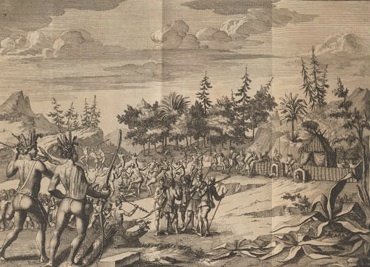 Illustration of Captain Weymouth impressing Natives of Pemaquid, Maine with a sword he magnetized by means of a lodestone. Engraved illustration of Pring's barricade in 1706 Dutch translation of the account in Purchas. John Smith's 1614 Map of New England. Map of Southern New England, 1620–22 showing Native peoples, settlements and English exploration sites. Samoset comes "boldly" into Plymouth settlement. Woodcut designed by A.R. Waud and engraved by J.P. Davis (1876). Sculpture of Massasoit in Mill Creek Park, Kansas City, Missouri by Cyrus E. Dallin (1920). 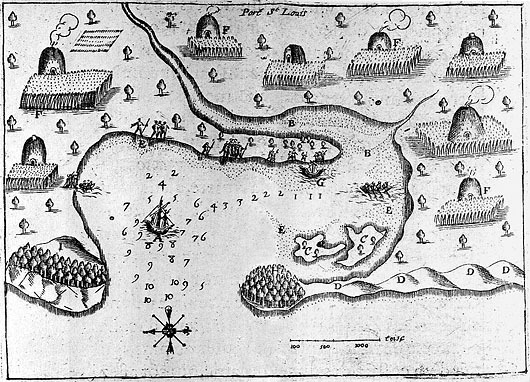 Engraving of a Pequot fort on Block Island in 1637 with design remarkably similar to the description of Nenepashemet's fort observed by Plymouth settlers in 1621. Map of Southern New England in the 17th century with locations of prominent societies of Ninnimissinuok. 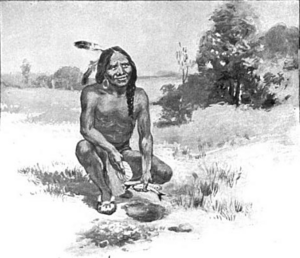 Squanto returning John Billington from the Nauset in a 1922 storybook for children. 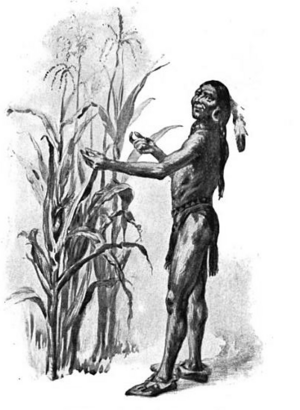 Squanto Facts for Kids. Kiddle Encyclopedia.